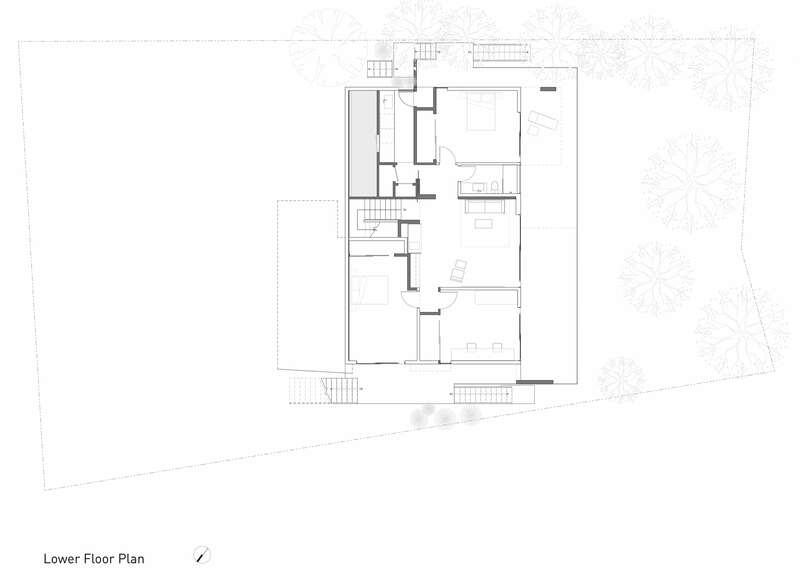 This project is a rebuild of an existing post 1991 fire-storm house. Situated high on top of the Eastbay mountain range overlooking the city of Oakland, the site has unobstructed views toward the southwest Bay and Golden Gate. It was designed for a young family, who desired an open plan home that embraced the views of the bay and a connection to the existing garden. The property has large redwood trees at the two longitudinal sides of the property, thus channeling ones focus from the front garden area to the to back views. 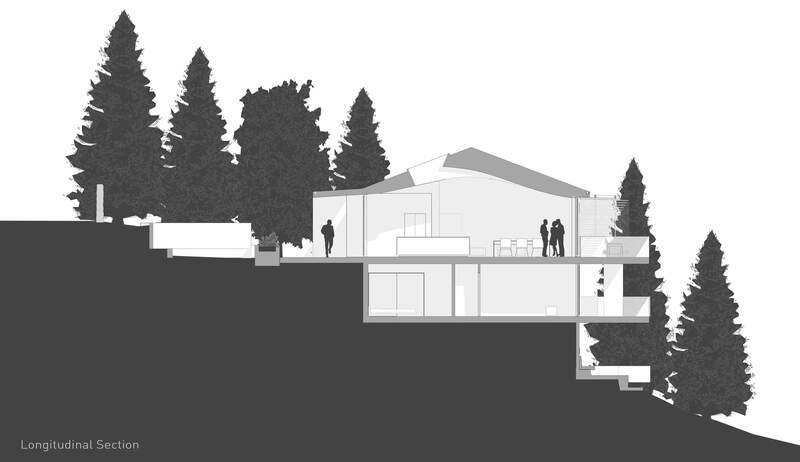 The design consists of shrouding the open common space in a wood tube that connects the garden in the front to the viewing deck off the living space at the rear. Situated near the top of the mountain range, about 1500 feet above sea level the site is confronted with extreme weather and wide temperature swings. The roof of the tube form is warped out creating a large ventilation volume for the living space echoing the wisps of the coastal fog flowing inward, thus cooling the interior with the afternoon breezes. 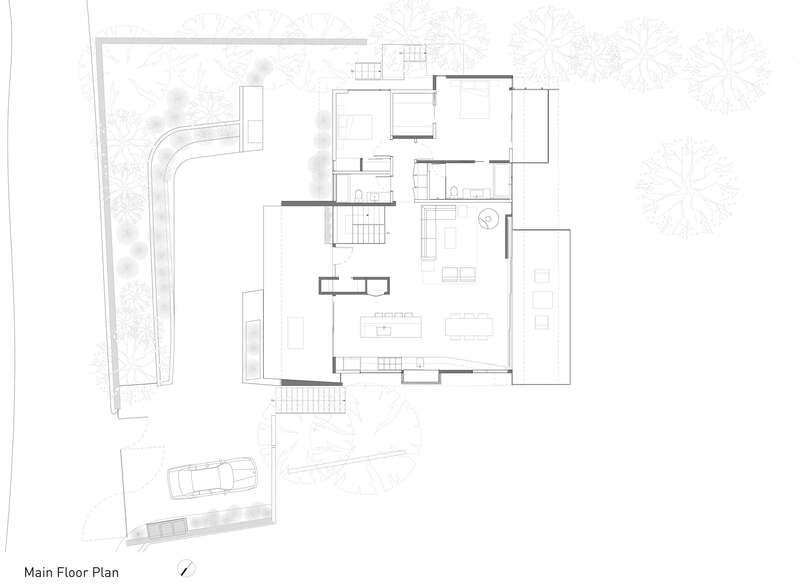 The main living space becomes the connector of the two contrasting outdoor spaces. Working with the existing floor plan the design transformed the kitchen area to open out and connect to the front yard garden and forming an outdoor dining area. A concrete planter/bench was placed to further define the outdoor garden space. Opposite of the remodeled kitchen the interior dining space seamlessly opens out to the viewing deck creating one large open space and extending the roof structure as a trellis to shelter the space from the direct sun. A new stair connects the main floor with the lower ground floor continuing the wood tube down through a crevasse to a media/projection room, bedroom and office area.